Never get the wrong gift again! 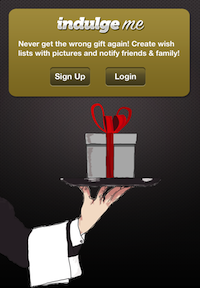 Create wish lists with pictures, and notify friends & family. 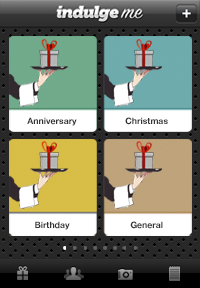 No more unwanted gifts or missed occasions! Take the anxiety out of shopping for and receiving gifts. indulge me allows people to create detailed wish lists of gifts, with pictures and barcode scans, for special events like birthdays, anniversary’s, weddings, baby shower’s, engagement, Thanksgiving, Christmas etc. Choose to notify family and friends via email or facebook immediately or a number of days before the event, to give them enough time to make the right purchase for the occasion! Get them to download indulge me so they can make their gift wish dreams come true! indulgeme is easy to use! 1-Create profile: Fill in your preferences and sizes. 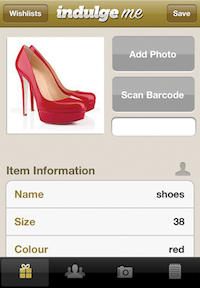 2-Create Wish Lists: Take a picture or scan the barcode of your desired item. Add a description and any notes, tag the store’s location and the item price. 3-Share with contacts: Add contact details of people to inform by email or via the app for specific occasions, i.e family and friends for a birthday or Christmas, colleagues for a baby shower, partner for an anniversary. Send a personalised message to notify loved ones immediately of your preferred gifts as you find them, or choose to schedule a notification up to two weeks in advance of the event. To use indulge me, you must log in to create wish lists and share these with your contacts. You can share the indulge me app by SMS/text message, facebook or emailing your contacts. By logging in with Facebook, you can choose to share your indulge me updates easily through the service. Compass Rose Marketing & PR Limited does not sell or share your data. connect with facebook forgot password?